Wild Wellbeing is a unique startup, responsible for bringing curated wellness activities and specialists into workplaces and festivals – including the Sanctuary at Wilderness Festival, and Somersault Festival. The company was built from the ground up, by two women who as founders have both had newborn babies in the past 12 months, a massive achievement in its own right. Collette: Pre Wild Wellbeing was a combination of many things that got us to where we are now, some holistic, some commercial. I started my professional career in the advertising industry working in film production companies as an In House New Business and Marketing Manager. After a decade in the industry including my own PR and Marketing agency, I decided to train as a yoga teacher, Rekki healer in Australia and then went on to study macrobiotic cookery as well as Ayurvedic medicine in India. Claire: I started in the wellbeing area at Secret Garden Party over 12 years ago after qualifying as an acupuncturist. Seeing the lack of healing areas at festivals and that there was no where to go and recuperate from a weekend of partying, I put my energy into creating a magical place where one could step away from the madness and walk into bliss. I still practice as an acupuncturist across London. SO WHERE DID THE IDEA FOR WILD WELLBEING COME FROM? Colette: Our partnership began 4 years ago when introduced by a mutual friend on the festival circuit, realising how much we had in common a conversation began that led us on a fantastically wild journey of expansion in the festival scene, growth into a corporate world and endless possibilities within the wellbeing sector. I saw a gap in the market for wellbeing in the workplace and after many attempts at bringing wellbeing into places where I worked, it was a breath of fresh air was to meet Claire. Claire: The balance is great, I’m the creative director, coming up with the ideas, and can visualise on the page what an empty space can potentially look like, themes, colours, types of therapies, programming. Colette is the brand power, she has harnessed her knowledge of building businesses, relationships and partnerships to grow the company from being just a couple of festivals into something much bigger with huge potential. Colette: The company officially was set up in 2013, the name felt organic, it combines a lot of things that we believe in. “Now I step into the Wild” is one of our favourite quotes and sums up both our lives; fearless and willing to give things a go. “Wellbeing” sums up what we are about in terms of our offerings to our clients and consumers. YOUR VISION IS TO BE OF SERVICE TO INDIVIDUALS WHO ARE INVESTED IN THEIR WELLBEING, HOW HAVE YOU CRAFTED THIS INTO A PROFITABLE BUSINESS? Colette: Being of service is about finding the gaps where you can serve. We have done this by providing festivals, private events, corporate events all highly tailored, and produced events that centre around wellbeing, offering a wide variety of treatments, activities and styles of production. I think the key has been our flexibility to cater to any event or situation. We can simply bring therapists to an office meeting or we can put on a 3 days spread of events to tantalise every aspect of wellbeing you can imagine. We have tripled in size in the past 2 years with a staff database of over 500 therapists on hand to serve the needs of our clients as per their requests. Claire: I spend a lot of time researching new types of treatments and activities to keep things fresh whilst Colette is opening doors to new partnerships on a daily basis, including those from her old industry. A lot of companies don’t have the budgets that Google have to be able to host wellbeing in house all year round. So Wild Wellbeing can provide pop up bespoke wellbeing events throughout the year as desired by a company, using local therapists to help the community and also build relationships with those companies nearby. The intention is that people can then sustain their newly found experiences in wellbeing once we have stepped out of the space. We do long term and short term contracts, retreats and private consulting in this realm and it’s really an exciting terrain. Colette: Festivals have been a stunning platform for us to get really creative, Claire has a field day curating these areas as the more magical and magnificent the better, as long as we are in budget of course! We have established a core team of freelancers that we go back to as they are reliable, know what we expect and know that we will pick up the phone and offer repeat business. WHAT WAS YOUR FIRST ‘BIG GIG’? 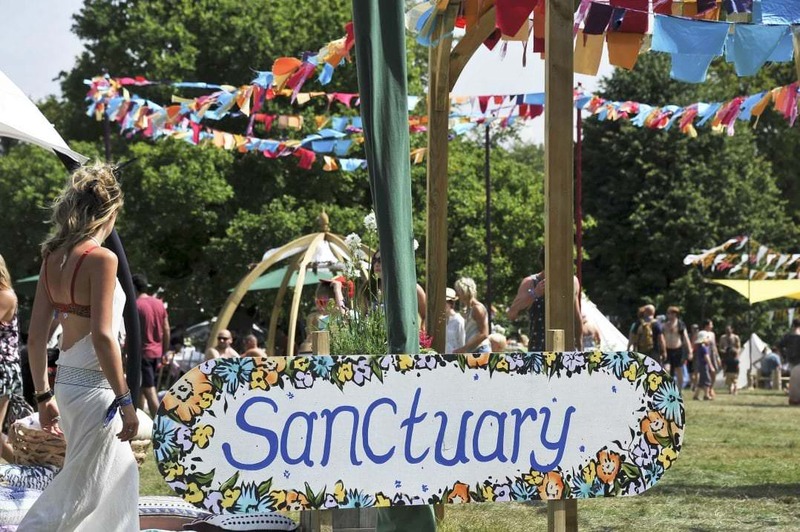 Claire: The Sanctuary at Wilderness Festival is our biggest to date. 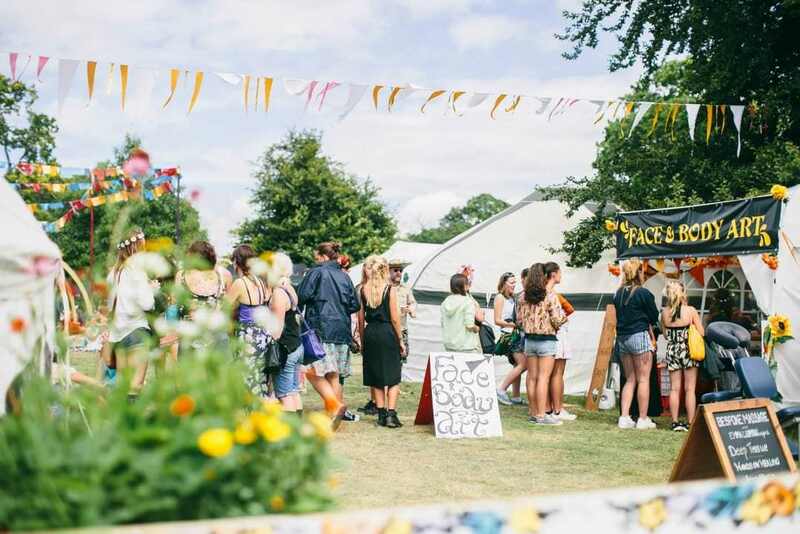 We have a staff of 400 to manage, 3 big tents to programme, over 2000 treatments going on as well as working with brand partners like NYR, Sweaty Betty and Pukka tea. It’s an enormous operation that takes a full year of planning. We spend months just on décor and layout alone, then there is all the online pre sales to go up, not to mention recruitment for our staff, we have over 25 reception staff alone! 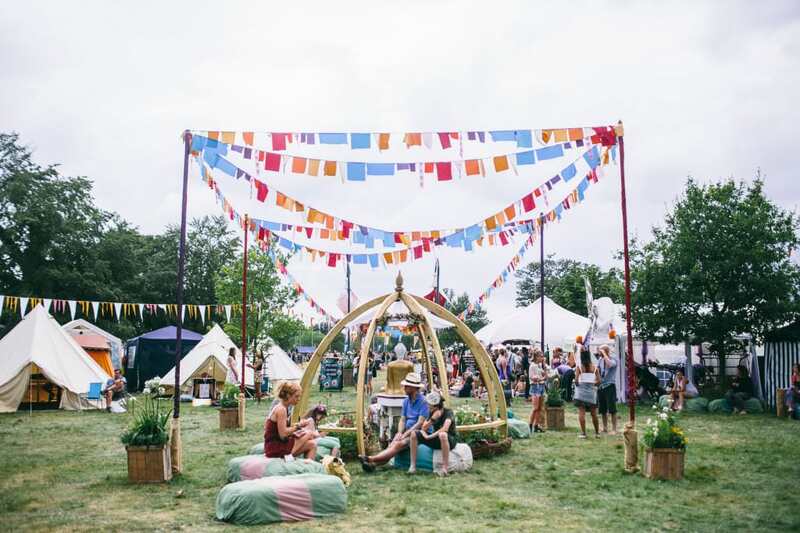 It’s rather extraordinary to see it all up in action, our organic restaurant full, all treatments booked out and the meditation classes brimming to the sides of the tents! TELL US ABOUT YOUR SUMMER PLANS… WHERE WILL WE FIND YOU? Colette: You can see all of our projects that we are involved in this summer here! 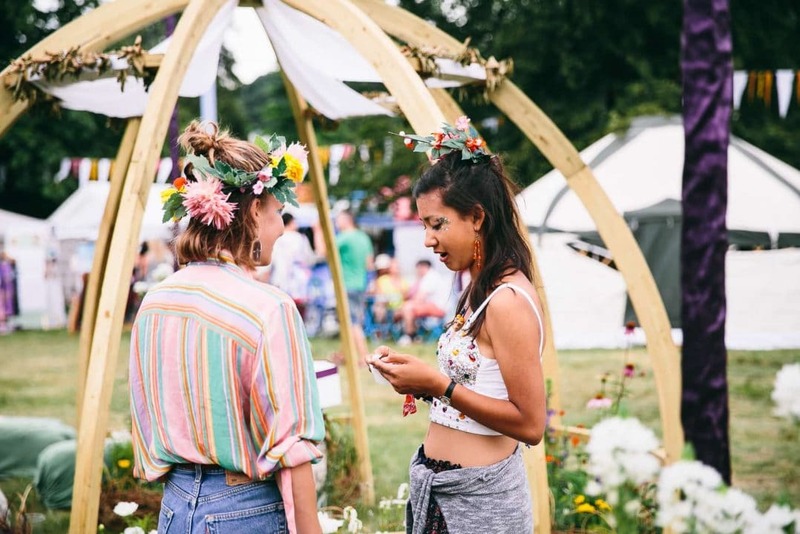 HOW DID YOU GET INVOLVED WITH WILDERNESS FESTIVAL? Claire: The festival approached us as their creative team are Secret Production Limited who were responsible for Secret Garden Party. Understanding the demographic they knew that a wellbeing area was critical to festival’s success and so invited us to take part. We love working with them and have subsequently been invited to work with Somersault Festival too. YOU’VE GOT PARTNERSHIPS WITH SOME INCREDIBLE BRANDS, LIKE REN, YOGAMATTERS AND PUKKA. HOW DO YOU CHOOSE WHICH BRANDS AND CLIENTS TO WORK WITH? Colette: I do a lot of research to find brands that are in line with where we are taking the company and ask them if they would like to get involved. A lot of the time they approach us, then we work out who sits in alignment with our ideologies. Sometimes it’s a balancing act with the festivals as they have their own targets to hit on sponsorships but usually are really accommodating to our requests of who we like to work with and we build strong relationships with companies like REN, Mio Massage Oil, Pukka Tea and Yogamatters as we really enjoy having them on site. They add a lot of value to our area and understand that we are not about hard selling we are about offering a genuine experience to people. People don’t want to be sold to they want to know that you were part of making them feel uplifted and brand new. Claire: The biggest challenge we have been faced with is our growth being very fast and how to manage a staff of over 600 for the summer festival season across 10 festivals! It has been a massive learning curve in operation management, how to collate all the necessary information from our staff, whilst ensuring they are all highly qualified with correct certifications, insurance, health and safety, whilst also keeping our relationships as personal as possible as we value the importance of a personal touch. Colette: The other main challenges both Claire and I have faced is having new born baby boys whilst setting this all up. My son is now 1 and Claire’s son 3 months so last summer I was with a newborn and this Summer it’s Claire’s turn! It’s been a real journey of many levels, how to juggle roles, split work loads so we can support each other through early motherhood without compromising our end results. AS WELLNESS ENTREPRENEURS, WHAT KIND OF VALUES WERE IMPORTANT FOR THE SUCCESS OF YOUR BUSINESS? Colette: The values that we hold dear are… Empowerment, as we believe that in order to take wellbeing seriously, you must first want to investigate it yourself and we want to give people that opportunity, then we create a space for people to make informed decisions through choice. Cultivation; as in how you maintain your wellbeing, and how can we assist you in your own maintenance of wellbeing by coming to you and being of service to your requirements. And finally, giving back. We strongly believe in giving back, we do so by donating our profits to mind.org. It’s a charity we strongly believe helps so many people as we see mental illness rise due to longer working hours and less people having time to take for themselves to switch off. You can read more about this here. HOW DO YOU SEE THE BRITISH WELLNESS INDUSTRY CHANGING, AND DO YOU THINK IT DIFFERS TO SAY, THE US OR AUSTRALIAN WELLBEING SPACE? Claire: We are at the brim of a MASSIVE growth in wellbeing. It is everywhere. We have watched it grow over the past decade and now are seeing awareness of personal wellbeing, workplace wellbeing just sprout up all over the place. It’s the new buzz word. The British industry has taken longer to take effect, people work harder, the weather is not as great, so we have to get creative. Colette: Outdoor activities are more limited to summer months and that’s why wellbeing at festivals works so well. The USA and Australia are one step ahead in the wellbeing sector and take it very seriously. They promote lunchtime classes and people leave work to go and be mindful, this is something we are still learning to integrate into our culture in the UK, rather than going to the pub! This is why what we are doing is so great though as we are growing as all the new studios, juice bars and other wellbeing facilities grow in the city too.